We here in Ormond Soft Furnishings believe a good paint can transform a room, Zoffany paints provide excellent coverage & a perfect finish in 128 beautiful colours that compliment all current trends as well as historic & period schemes. These beautiful paints also work fabulously with their stunning range of wallpapers as the colour palettes compliment completely. 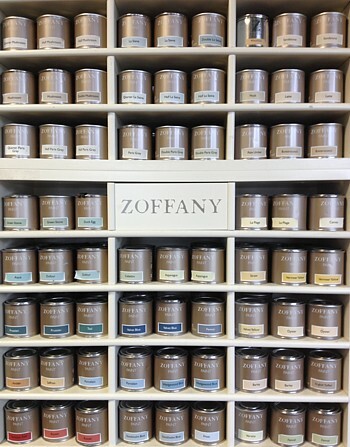 We stock the full range of Zoffany Paints sample pots. All of which are available to order in Flat Emulsion, Acrylic Eggshell, Eggshell and their brand new Elite Emulsion, a washable and stain resistant matt emulsion paint for modern living. This water-based finish is ideal for kitchens, bathrooms, children’s rooms and high traffic areas. “The new Zoffany palette comprises 128 colours and reflects the demand for subtlety in tone and the ability to match colour perfectly to the soft furnishings within the scheme.